In my household, we do not eat meat everyday. We are not vegetarians but we choose to have some days without meat. There are a few different reasons why we do this. For example, eating meatless meals can often be cheaper than meals with meat- so we choose meatless meals to help save money. We also do it for health reasons. I do not believe that most meals should be filled with meat and there are plenty of awesome alternatives. Eating meatless is also a sustainable choice because it often has less impact on the environment than eating a meat-filled meal. As a dietitian, I am well aware of the vegetarian sources of protein and on days that we do not eat meat, we focus on having a vegetarian protein source. Americans often eat a lot more protein than what their bodies need. We constantly hear to eat more protein but most people are consuming more than they really need to. Many people love to participate in "Meatless Monday" where on Mondays, they do not eat any meat. I do not stick to a certain day but when I am meal planning, at least 1 day is going to be meatless, usually more like 3 days in a week though. 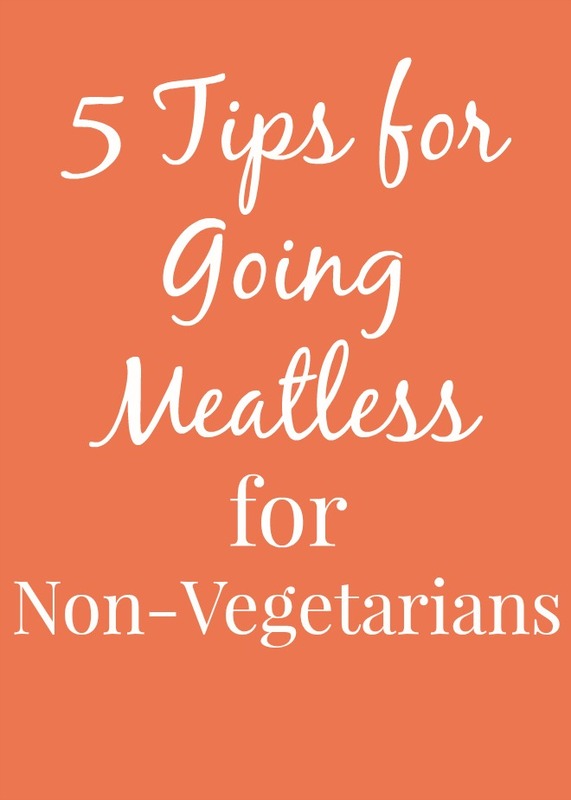 When planning, choose meatless meals right away so you are more likely to stick with your plan. There are tons of meatless recipes that my family loves that I make regularly. Keep trying recipes until you have a list of vegetarian meals that you truly love. Some of my favorites are loaded chilaquiles, lemon garlic roasted vegetable pasta and spiralized pad Thai. Some people may think that you need to eat meat in order to get enough protein each day when this simply is not true. There are many vegetarian sources of protein including: beans, nuts, seeds, cheese, yogurt, milk, tofu, soy products, eggs and more. Having a variety of these foods will help you get plenty of healthy sources of protein through the day. Unless you have a certain condition or are a competitive athlete, 0.8-1.0 grams of protein per kilogram of body weight should be plenty. This equals 51-64 grams of protein per day for an 140 pound woman for example. Some people believe that you need a gram of protein for every pound or have other ideas about how much protein you need. Do not feel the need to go super crazy on protein because you are probably getting enough with the variety of foods that you eat on a daily basis. If you love chicken parmesan, why not try eggplant parmesan? If you like a fully-loaded burger, try a fully-loaded veggie burger. Swap beef enchiladas for black bean enchiladas. Have a tofu stir-fry instead of a chicken one. The MorningStar Farms® Veggie Bowls are perfect for vegetarian meals that are close to your favorite meat-filled meals. They have a chik'n pot pie, chik'n tikka masala and Italian sausage bake that are all similar to meals that contain meat. They also have a couple of other fun ones including Japanese soba noodles and a Mococcan medley. You can find these at Walmart. They are rich in vegetarian sources of protein. We bought the Italian Sausage Bake and both thought that it was so good! Though we have never had a bad product from MorningStar Farms. I just added a bit of spinach for veggies and green onion and tomato for garnish. The Veggie Bowls are super tasty and even though I eat meat, I still love them! You don't have to be a vegetarian to eat these. They heat up quickly and are great especially for a lunch on-the-go. In fact, my very favorite kind of sausage that I cannot stop buying is the MorningStar Farms maple sausage patties- they are so, so good!